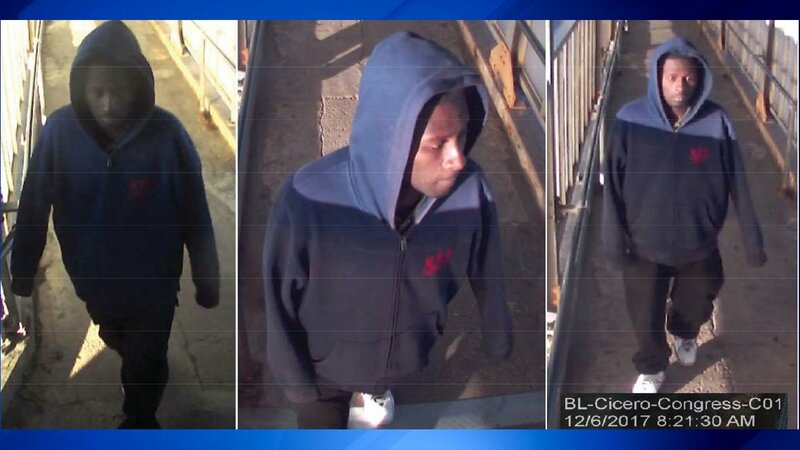 CHICAGO (WLS) -- Chicago police have released surveillance images of a suspect wanted in connection with the groping of a female student on a ramp leading to a CTA Blue Line train platform Monday. The incident happened at about 8:20 a.m. on the platform at the CTA's Blue Line Cicero station. Police said the 18-year-old victim as followed by the suspect, who continually yelled at her. The man caught up to her at the platform and grabbed her from behind an inappropriately touched her. As the victim attempted to pull away, she fell to the ground, causing her wallet to fall on the platform. The man grabbed the wallet and fled from the station. On Friday, police released surveillance images of the suspect. The suspect is described as a black man, 20-28 years of age, 5'6-5'8, with a thin build. He was wearing a hooded jacket which was light blue on the top area and black on the lower area, dark jeans and white colored gym shoes. Police are asking the public to call 911 to report any suspicious activity. They also urge riders to walk in pairs and stay in well lit and populated areas.